The epic voyage of Thetis delivering Achilles’ spectacular new armor spans nearly 2,600 years of art history, adorning works as diverse as ancient Greek vases, magnificent gold jewelry, bronze chariots and silver coins, Royal Vienna ceramic plates, epic oil paintings, and modern Greek banknotes. and he wrought him greaves of pliant tin. he took and laid it before the mother of Achilles. bearing the flashing armour from Hephaestus. By delivering this immortal armor to her son, Thetis will enable Achilles to charge into the front lines of the battle in search of his fate, in search of Patroklos’ killer, Hektor, the thief who stole Achilles’ beloved and stripped him of Achilles’ own armor. Thetis knows the weapons will not save Achilles from death – his death will follow close on the heels of Hektor’s death, but with these glorious arms, Achilles will avenge the death of his beloved companion Patroklos, usher in the closing act of the Trojan War, and he will attain the immortal glory that only a hero’s death can achieve. and Thetis came to the ships bearing gifts from the god. seeing he hath been slain once for all by the will of the gods. neither dared any man to look thereon, but they shrank in fear. and he was glad as he held in his arms the glorious gifts of the god. such as no mortal man could fashion. Following up the recent post, Hephaestus Forging the Shield of Achilles in Art Through the Ages, the gallery of images in this post highlight the ageless appeal of Thetis’ delivery of Achilles’ shield and the rest of his glorious armor to her heroic son. As artists from all over the world have been inspired by this epic delivery, it’s amazing to see the variety of images and the interesting variety of media chosen for such legendary adornment. But Where Did the Hippocampus Come From? What’s really fascinating to me is all the depictions of Thetis riding a half horse-half sea monster, better known as a hippocampus, skimming the ocean waves with armor in hand, often accompanied by her sister Nereids. This seagoing mode of delivery is clearly not in accordance with Homer’s narrative – he says she flies ‘like a falcon’ down from Olympos – and, try as I might, I’ve had no luck at all finding a literary source for this clearly popular portrayal of Thetis riding a hippocampus. and stepped upon his car, and set out to drive over the waves. did the prancing steeds bear their lord. Homer clearly doesn’t describe a team of horses with fish tails, but, at least as early as the 6th Century BCE, vase paintings begin portraying Poseidon’s horses as sea monster/horse hybrids. From this point forward, I guess it’s not difficult to imagine Thetis and her sea-nymph sisters riding these legendary sea creatures, too. Throughout history, the portrayals of Thetis delivering Achilles’ immortal armor are divided into two basic categories: Thetis presenting the armor to Achilles, and Thetis carrying armor while riding a hippocampus or some version of a sea-beast (even a merman, or Triton), en route to Achilles. In both cases, she may or may not be accompanied by her sister sea-nymphs. By the way, if you know of any literary source(s) mentioning Thetis delivering the armor of Achilles on a hippocampus, please leave me a message in the comment section, below. I’d really like to know where this fantastic inspiration came from! 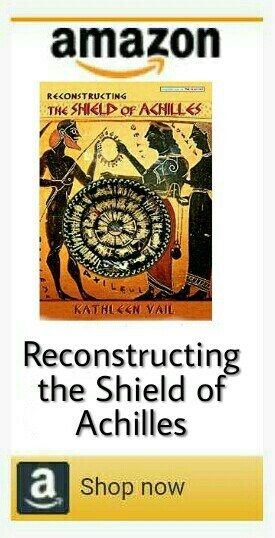 I’ve tried to find as many portrayals of Thetis delivering Achilles’ armor as possible, and I’ve provided the sources with links in the image captions. It’s been a fun treasure hunt – I’ve even found study drawings for the two paintings by Benjamin West. The images are arranged chronologically from the oldest to the most recent, with the dates noted in the titles. Can you imagine any other subject spanning 2,600 years of art history? All of the following depictions are awesome, but I’m especially excited to find several very recent artworks depicting Thetis carrying the shield of Achilles – I’ll think you’ll be impressed, too! –Please note that some of the images are copyrighted and their use in this blog post is meant only to highlight their existence. I appreciate the honor of featuring these artworks, but if any copyright owner is troubled by this, please notify me and I will gladly take down the image immediately. Thetis Presenting Achilles New Armor, Attic black-figure Column Krater attributed to the of London B76, ca. 560 BCE. Source: Non-Commercial use only © Drawing by Valerie Woelfel via CHS. Thetis riding a hippocampus, delivering Achilles’ new armor. Athenian Red-Figure Kylix Tondo attributed to the Q Painter ca 400-300 BCE. Source: For Non-Commercial Use Only © Classical Art Research Centre. Since this is my favorite topic in basically the whole universe, it’s hard for me to choose which is my favorite image, although I’m really drawn to Thetis delivers to Achilles the arms forged by Vulcan by Henri Regnault (XLI). On the other hand, I treated myself to the 1910 silver drachma with Thetis carrying Achilles’ shield after finding one on eBay on my last birthday. It’s my favorite treasured possession! Have you decided which is your favorite image? I’d love to know! Thank you so much for these wonderful comments and images, Kathleen. I couldn’t say which I like best…I love them all! Thanks so much, Virginia, I’m happy you enjoy them, too! Hi Kathleen, I simply love this post. The images are fabulous and it’s difficult to choose a specific one because they are all so wonderful. However, I rather like the digital painting, Straight from the Forge by CATANDCROWN, 2012. I don’t usually like modern images but this one is very appealing. Is it permissible for me to print it out to frame and hang in my study Kathleen ? Hi Rita, I’m glad you enjoyed these great images, too! I love that one by catandcrown too – it’s so powerful! I’m not really sure about printing that picture, tho – I think it’s best if you click on the link to her page on DeviantArt and leave her a message. I don’t really think you’d be infringing on her copyright, imho, since you’re only printing it for your own personal enjoyment, same as anyone can print basically anything they find on the internet for their own personal enjoyment. Hope this helps, Rita! O.K. Kathleen, Enjoy your weekend. ! What a truly magnificent post, Kathleen. Not just wonderfully informative but inspirational. I will be hugely excited to share it with the Bath Writers and Artists group. Thank you so much! Hello Sue! Thanks so much and please give my greeting to everyone in your wonderful group! A glorious post,well-organised and rich in significant artworks.Can’t tell which one is my favourite,they all bear the signature of renowned artists.Kudos to you Kathleen on your superb work. Glad to see you’ve posted “The Triumph of Achilles” by Franz Matsch,which is in Achilleion (Corfu),there is a fault on it and a sad story behind it …. I’ll tell you some other time. Thanks so much, Dear Doda! Now I can’t wait to hear the story… even if sad… enjoy your holidays and I’ll be happy to hear from you when you get back!